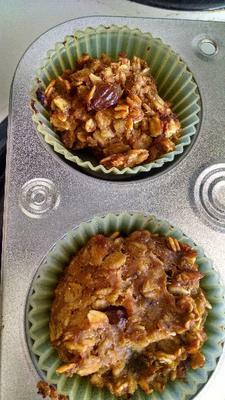 Solar Oven Gluten-Free Pumpkin Oat Muffins - YUM! Today was my first shot at baking in the solar oven. I bought a small muffin tin at Goodwill and whipped up a batch of the kids’ favorite pumpkin muffins. I was a little nervous about baking such small quantities (6) at a time, but I think I should have been nervous about more than just that. It sounds so stupid, but every time I use the solar cooker I am reminded how important the sun is. For a solar cooker. Duh. I know. But having a good angle and getting the correct cookware makes all the difference. My first tray of muffins was in the cooker for three hours and still mush, even though the sun was out. I was so frustrated. I though maybe I was just a poor baker. Then I did a little reading and found out that reflective metals (like my shiny muffin tin) reflect the sunlight back out of the cooker. No wonder it didn’t get up to temperature! The solution is equally as easy. If you cover the pan with a black cotton dishtowel, your problem is completely solved. I put the tray in for 40 minutes with the towel, and the muffins cooked up nicely. After that, it only took about an hour per pan of muffins. It still took all day to cook up all of he batter, but at least they turned out well! Mix the first three ingredients together until the banana is well blended. Add in the other ingredients and mix by hand. Drop into silicone baking cups in a muffin tin. Solar cook for approximately one hour. My kids love these muffins, by the way, and they are gluten-free and vegan! Rating: eventual success! I’m definitely learning a lot here!